Huseyin Burak Gunay, Liam O'Brien, Rhys Goldstein, Simon Breslav, and Azam Khan. 2013. Development of discrete event system specification (DEVS) building performance models for building energy design. In Proceedings of the Symposium on Simulation for Architecture & Urban Design (SimAUD '13). Society for Computer Simulation International, San Diego, CA, USA, , Article 22 , 9 pages. The discrete event system specification (DEVS) is a formalism for describing simulation models in a modular fashion. In this study, it is exploited by forming submodels that allow different professions involved in the building design process to work independently to create an integrated model. These submodels are the building, the HVAC system, and the occupant. 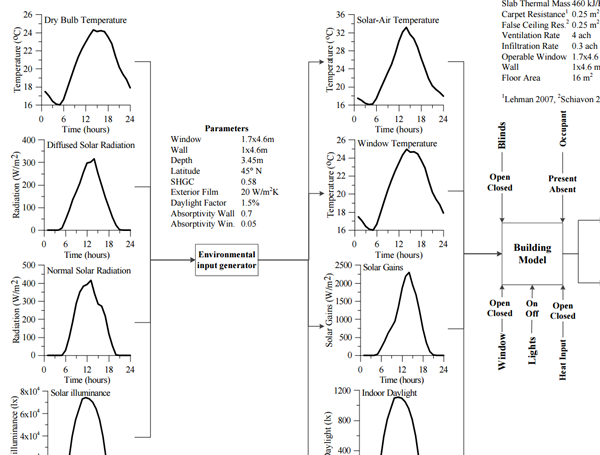 In this study, a coupled DEVS building energy model of a generic office space is presented to demonstrate the viability of the DEVS formalism for BPS based design. Results indicate that the DEVS formalism is a promising way to improve poor interoperability between models of different domains involved in building performance simulations.